As family and friends return for the December festival season, you are probably wondering how to keep them busy. Here’s a list of activities happening during December 2017. MAC4 ExhibitionÂ opens December 5 and runs until January 2, 2018. It is a mixed media exhibition organised by the Montserrat Arts Council. This yearâ€™s artists are Kirk Brade, Susan Edgecombe, Thanendran Singarajah and Valbaun Galloway. Christmas CarolingÂ on Monday, December 25Â Â – A FREE event where community groups come together to celebrate the reason for the season. Soca Monarch on Tuesday, December 26 – Find out who the groovy and jumpy soca kings or queens will be. St. John’s Day – All Day party from sun up to long after the sun sets in the heart of St. Johns. Night of the Bands on Thursday, December 28 – Live Bands every half hour. Ole School Dance Party on Thursday, December 28 – This is a grown folks party. Wear your party shoes and come prepared to dance all night as we raise funds for the Meals on Wheels programme. Queen of Queens on Friday, December 29 – This is a competition featuring the best female calypsonians from across the region. Montserrat’s entry will be the female with the highest ranking after the semi-finals. The music and entertainment is always top notch. Calypso Finals on Saturday, December 30 – Now that the numbers have dwindled, the stakes will be higher. You don’t want to miss this entertaining night which features the best of the best of local singers. Salem Nights Live at Bamboo Grill on Salem main road, every Saturday. Calypso Eliminations are on Saturday, December 9. This is the best night to hear the good and the bad from all the veterans and newcomers to calypso. Market Day & Christmas Goodies Competition on Friday, December 15. Sample tasty treats and stock up on meats, fruits and vegetables for the season. Lots of entertainment. SongFest 10Â on Friday, December 15 – This is the 10th year for this original song competition organised by the Church of God of Prophecy. More than 20 children and adults compete for the top spot and prizes. Volcano Catch – December 16 – 17. Fishers compete for $50,000 in cash and prizes. Sir Howard Fergus Scholarship Fund Dinner on Saturday, December 16 – This annual event raises funds to assist students pursuing careers in the creative and entrepreneurial sectors. St John’s Action Club Princess Show on Sunday, December 17 – This evening filled with young talent is a reason to get dressed up and cheer on your favourite princess. Governor’s Christmas Open House on December 18. Her Excellency the Governor Elizabeth Carriere will open her home for children to enjoy. Nite of Pan on Wednesday, December 20 – Steel bands from the local primary schools, Volpanics and Genysis Steel Orchestra play traditional and the latest hits all night long. There is always a visiting pan group from neighbouring Antigua, which is sure to thrill the audience. Expose, Compose Shoot Photography Workshop on Thursday, December 21. 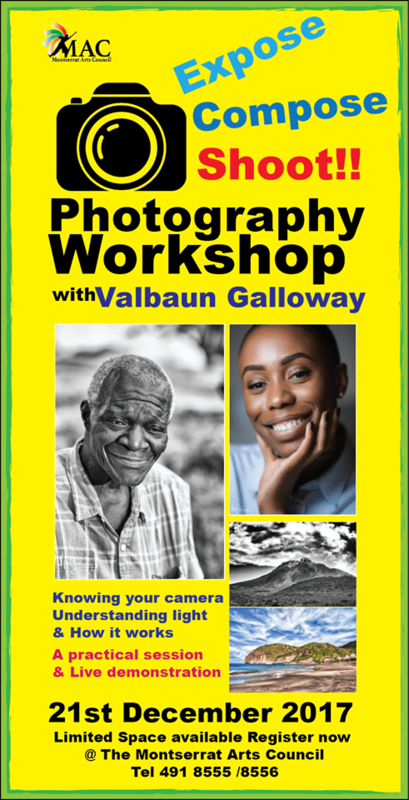 Register at the Montserrat Arts Council as spaces are limited. Opening of FestivalÂ on Friday, December 22 – Get a taste of what is to come for the 55th celebration of the Annual Festival. Calypso Semi-Finals on Friday, December 22 – The best ten will go through to the finals to take on the reigning calypso king, King Natty. This event begins after the official opening of festival ends in the village.